A stunning debut; a Departures original publication. 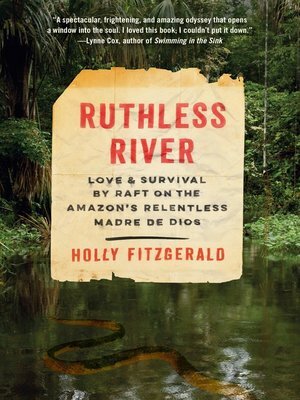 The ultimate survival story; a wild ride—the wildest—down a South American river in the thick of the Amazon Basin; a true and thrilling adventure of a young married couple who survive a plane crash only to later raft hundreds of miles across Peru and Bolivia, ending up in a channel to nowhere, a dead end so flooded there is literally no land to stand on. Their raft—a mere four logs—separates them from the piranha-and-caiman-infested water until they finally realize that there is no way out but to swim. Vintage Original. Holly FitzGerald and her husband, Fitz—married less than two years—set out on a yearlong honeymoon adventure of a lifetime, backpacking around the world. Five months into the trip their plane crash lands in Peru at a penal colony walled in by jungle, and their blissfully romantic journey turns into a terrifying nonstop labyrinth of escape and survival. On a small, soon-ravaged raft that quickly becomes their entire universe through dangerous waters alive with deadly animals and fish, their only choice: to continue on, despite the rush of insects swarming them by day, the sounds of encroaching predators at night. Without food or means of communication, with no one to hear their cries for help or on a search-and-rescue expedition to find them, the author and her husband make their way, fighting to conquer starvation and navigate the brute force of the river, their only hope for survival, in spite of hunger and weakening resolve, to somehow, miraculously hang on and find their way east to a large riverside town, before it is too late. . . .